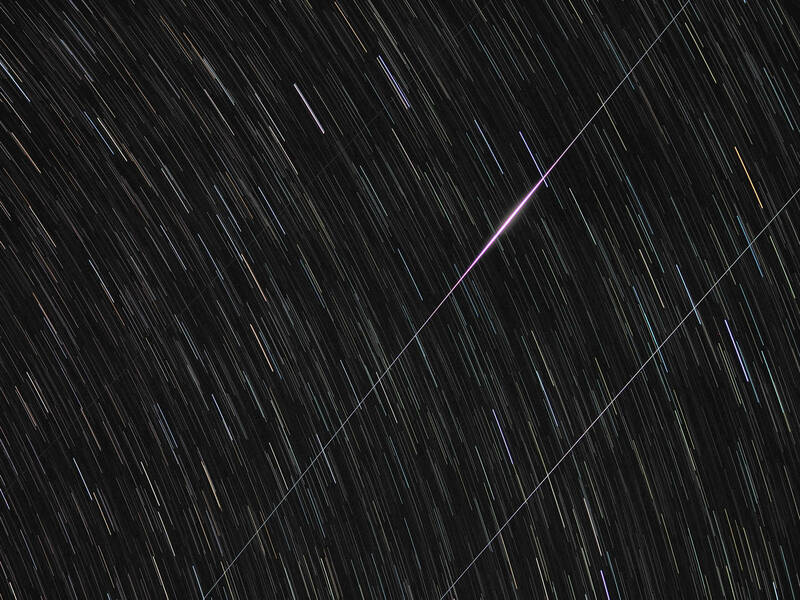 Two Iridium Flares in the same area of the sky - 96 seconds apart! Both satellites were visible for at least thirty seconds prior to the beginning of their "flares"... and both remained visible for perhaps three minutes afterward, as well. The dimmer of the two appeared first (Iridium 58), and reached Mag +0.8. Rather unusually, it remained close to maximum brightness for quite a while, and as such, its track appears nearly uniformly bright in my photo... although upon close inspection, the central portion of the track is just barely perceptibly brighter than its extremities. The brighter flare (Iridium 59) reached Mag -7.2, and was a glorious sight. This is a single-frame "Live Composite" shot, taken with a 75mm f/1.8 Olympus lens at f/2.8 and ISO 200, on my Olympus OM-D E-M1. The FOV is ~16° diagonally, and the total exposure-duration was about seven minutes. I watched naked-eye throughout the event... and the much dimmer third satellite which appears in the photo was completely invisible to my eyes (click on the photo, to see it). Two other polar-orbiting satellites passed through this same area only a couple of minutes prior to the two Iridiums. Iridium flares have been a personal favorite since someone at a desert star party mentioned that an Iridium flare was going to be occuring in a minute or two. to be followed by a shout out, and there it was, one of the brighter events, maybe a -8 mag. And I was hooked. At first thought it appeared to be a little more work than I wanted to put in on it. I can be a little bit lazy. Entering my exact location was already pushing my puny computer skill set, but after that initiation by fire when that first Iridium crossed over from being just another satellite, to starting to brighten to an almost unimaginably dazzling dagger of photons piercing my eyes till I almost feared vision damage. At what level do your eyes start bleeding? Then it rapidly faded to almost nothing as it resumed it's almost Clark Kent like mild mannered persona and resumed life as a common satellite. Wow! And double Wow! It actually was very easy to get predictions of future events from Heavens-Above, and I would follow the flare events, along with passes of the ISS. They allowed me to keep a low level of astronomy in my day to day life. Then, for the last year or so, there started to be a different level of activity, with the appearance of multiple Iridiums on the same path, sometimes mere seconds apart! Visually I had been after the bright ones only, those -6 to the -8 mag events, but now there was a new game playing out. My most memorable had two satellites paired up at about a five degree separation as they appeared to pull themselves across the firmament, flying in formation. Mesmerizing! I had heard that the program was coming to the end of that generation. The gathering together of the constellation of roughly sixty-six units was the beginning of their end, with my old friends being deorbited. Called back home to burn up over the oceans. There came a period about a month or two ago where Heavens-Above had few entries, then none. I thought that was the end, but it was just close to the end. A few stragglers are still being rounded up, and some last opportunities to see the sky show are presenting themselves. They are being moved around, so there's a chance that the predicted appearances will be off, but persevere. This maybe your last, last chance to enjoy their beauty.